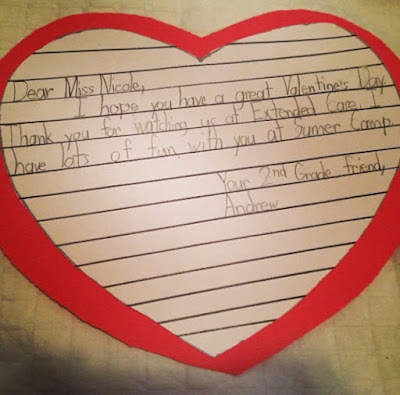 "Mrs. X and I were just talking about how wonderful Andrew is, and I remembered this sweet Valentine from him way back in the day!" This isn't a tale of Andrew's sweetness (though he sure was!) but rather of somebody thinking a kind thought about one of my children and actually reaching out to tell me. So many times I think about how wonderful somebody is but don't go the next step to let them know. Gotta change that! A police officer, who had graduated from the high school where I work, was killed in the line of duty last year. Our school had a dress down fundraiser for his police troop on the Cape, and I witnessed so many people donating more than the required $2 to dress in blue. People can be so generous! The officer was generous with his life, and now others are stepping up to be generous to his charity. My mom was in the hospital, recovering from her surgery, and was placed in a room with another patient. My dad noticed the room across the hall was a single room, and had just been vacated. He went to the nurses to ask them if my mom could have a single room. They made it happen, and so my dad went to Trader Joe's to buy them chocolates as a thank you. When he got to the register, the cashier asked him if he wanted them in a smaller bag, and he said yes, because they were gifts for the nurses at the hospital. The cashier called over to her manager and let her know (through hand gestures) what was happening, and they surprised my dad with a big bouquet of flowers to bring to the nurses who work so hard. Doesn't that story just make you want to shop at Trader Joe's only and forever? And also, it shows how kindness spreads - my dad was looking out for my mom, the nurses took care of him, he took care of them back, and the store employees helped out too, and now I want to support Trader Joe's by spreading the word of their kindness. These are all examples that just happened to me, and I'm sure there's more of these generous, kind, "God Winks" happening all around us that are not as noticeable. It warms the cockles of my heart to remember that humanity can be such a beautiful witness of God's love. We were foster parents 2 years ago, had the best little lady named Leah we wanted to keep forever, but she ended up with family she never knew (loooong story) it crushed me. Lately though, fostering again has been on my mind and prayed for a sign that I should do it again. I needed God. I am an claims adjuster and handle car accident injuries and was asking typical questions about who was injured, and the child that was injured was named Leah. There's my sign. Working on paperwork today. Wow, how cool! I admire foster parents so much, my husband's family fostered his sister when she was a teenager and she became a Sister and she's just the best. Thank you for what you do!! !